Lectade Liqud Concentrate is a fast acting oral rehydration therapy for dogs and cats suffering from dehydration or diarrhoea. It is an effective remedy for treating debilitated pets. This non-antibiotic solution is a supportive treatment for post surgical, viral diseases, disease convalescence and concomitant treatment of viral or bacterial scours. The solution is an ultimate source of fluids during treatment. Lectade Liquid Concentrate oral solution contains a mixture of mixture of glucose, glycine and electrolytes. The compounds glucose and glycine are quickly absorbed by the intestinal tract helping water and sodium to be absorbed simultaneously along with these nutrients. This ensures high level of rehydration in affected dogs and cats. Give two to three times a day. Dilute 1 part concentrate with 11.5 parts water and give orally. Administer orally via dosing syringe. Continue treatment for 1 to 2 days after recovery also. A super rich concentrate to treat diarrhoea, dehydration, post-surgical diseases or bacterial scours. 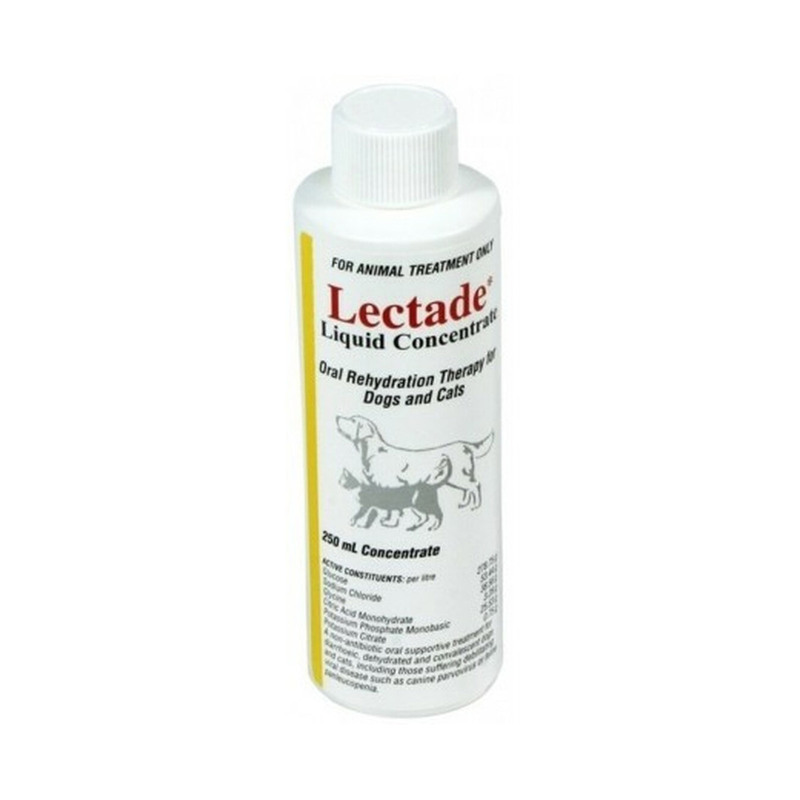 Lectade solution is an effective rehydration product for dogs and cats. It fast action starts working instantly by directly being absorbed into the system. The fluid instantly rehydrates scouring and dehydrated animals. Keep it away from damn places. Store prepared solution in refrigerator for 24 hours or frozen for seven days before discarding. No possible contraindications found yet. This liquid is very useful when pets are dehydrated. It acts as a great rehydration therapy and quickens the healing process.